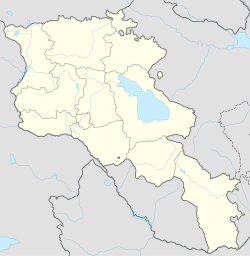 Ptghunk (Armenian: Պտղունք, also Romanized as Ptghunk’, Ptghounq, and Ptkhunk) is a village in the Armenian province of Armavir. The village is about 10 miles from Yerevan on the road to Komitas, and is close to the Zvartnots airport. The population of Ptghunk is about 1,400. This article about a location in Armavir Province, Armenia is a stub. You can help Wikipedia by expanding it. This page was last edited on 25 May 2017, at 13:10 (UTC).